Visual Studio 2017 solution with the tutorial source code. Microsoft SQL Server database (LocalDB). Includes C# and VB projects. This is an ASP.NET MVC version of the original ASP.NET WebForms Hotel Room Booking tutorial. 6. The Scheduler scale (cell duration) is set to "Day". The event (reservation) boxes are customized using BeforeEventRender event handler. It uses a custom duration bar color depending on the reservation status (gray, yellow, blue, etc.). It shows how much has been paid already ("50%"). e.ToolTip = "Expired (not confirmed in time)"
Dim paidColor As String = "#aaaaaa"
If the move operation is denied the user will be informed in the integrated message bar using UpdateWithMessage() method. message = "The reservation cannot overlap with an existing reservation." message = "This reservation cannot be changed anymore." message = "The reservation cannot be moved to the past." 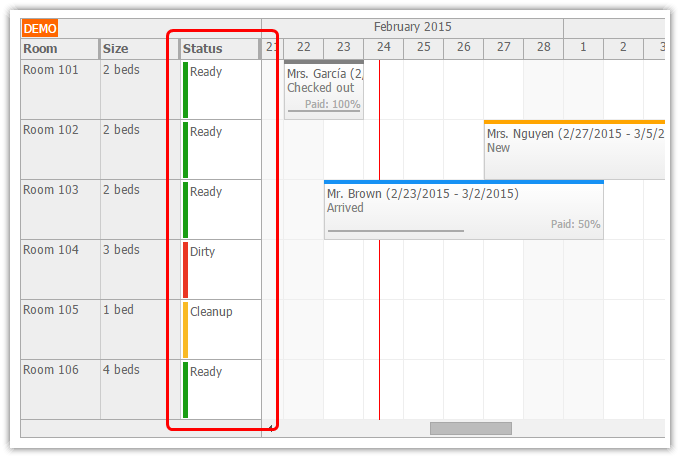 The rooms can be filtered using a simple drop-down list above the Scheduler. The selected filter value is stored in the ClientState and a refresh of the Scheduler is requested. The value of the current filter is used when loading the room list from the database using LoadRooms() method. Dim roomFilter As String = "0"
If you use Scale = TimeScale.Day the day cells will begin at 00:00 and end at 24:00 each day. To use a custom check-in/check-out time you can set the Scheduler to use a custom timeline. In this example the check-in and the check-out time are both set to 12:00 (noon). Set the bottom time header row to be grouped by day (GroupBy.Day). The default row header group mode aligns the header cells with the grid cells (GroupBy.Cell). Angular hotel room reservation application. 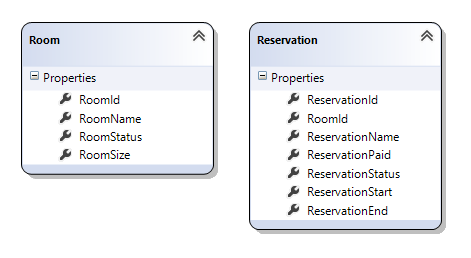 The user interface supports managing rooms (create, edit, delete, change status) and reservations (create, edit, move, delete, change status). Includes a PHP/MySQL backend with token-based authentication. How to enable column sorting for resources in the ASP.NET scheduler control. Includes sample C# and VB.NET projects. ASP.NET web application project for managing restaurant table reservations. Finds a free table using a fast filter. Highlights conflicting reservations. This tutorial shows how to create an annual leave booking application for ASP.NET. Includes C# and VB.NET source code and sample SQL Server database. How to activate resource column sorting in the ASP.NET MVC scheduler component. Sample Visual Studio 2012 solution available for download (C#, SQL Server).